One of the local parks host maple sugar events in late February. 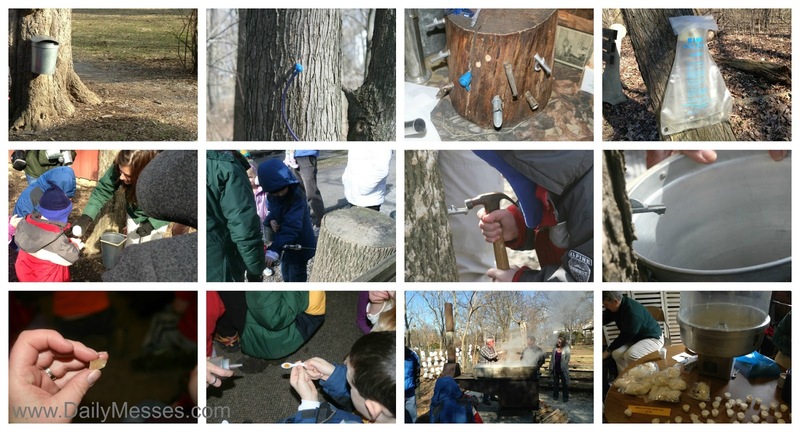 They have an event/class for kids during the week that teaches them about harvesting and making maple syrup. For one weekend only, they host a larger event with different types of maple syrup foods, including cotton candy made from maple syrup! The weekend activities also allow everyone to see the tapping buckets and the evaporator in action. Along the way we saw a couple of trees with a spout and tube attached. The tubes ran down to a large bucket to collect the sap. The naturalist told us there were a few downsides to the piping though: it was more expensive to use, larger animals could walk by and pull out the tubing or knock the buckets over, and squirrels liked to chew through it to eat the sap. However, there is a coil that can go around the tubing to help keep the squirrels off. Towards the end of the hike, we stopped at a tree that had been tapped. The naturalist poured some sap into everyone's hands to try. It was clear and ran like water. It also tasted a lot like water, but slightly sweet. The kids then got to take a turn at hand drilling a hole in a trunk and hammering in a spout. After sap tasting, we ended back in the barn. The naturalist told us that real maple syrup is more expensive because it can only be collected for a short time (when the ground starts to warm up, with cold nights and warmer days, but before the tree buds open) and because the maple trees only grow in certain areas (mostly Canada and parts of the United States). We also learned that the sap usually starts at 2-4% sugar content. After boiling it down to remove a lot of the water content, the sap will turn to a syrup of 66% sugar content. The syrup will be strained to get any particles (or bugs) out before bottling. It takes 10 of the parks buckets to make 1 gallon of maple syrup! At the end of the program, the boys got to taste maple syrup and even a piece of maple candy! The candy is created when they keep boiling the sap past the point when it becomes syrup. I would highly recommend checking out your state and local parks for kid programs. So far, I've been happy with the programs and the kids really enjoy them. Many of them are free, although a few have a small fee (like the maple sugar class during the week for $5/kid). The grade of syrup is based on the color of the syrup, not on quality. The lighter color has a more delicate maple taste, whereas the the darker colors will have a stronger maple flavor. When the sap is boiling, you can add some butter to stop it from boiling over. If you want to try making your own maple syrup, it might be ok to boil it in your kitchen for a small batch. However, the naturalist said that larger sized batches are always boiled outside since the steam is sticky and can even peel off wallpaper. The sap is stored in the tree roots during the winter. In the beginning of spring the sap starts to come up from the roots and travels up the tree towards the branches. During the summer, the leaves convert the sunshine into food for the tree (sugar). The naturalist stated that they tapped sugar maples. She said you could also try red maples, although their sugar content isn't quite as high. The weekend exhibit had a Native American and pioneer demonstration on how they made maple syrup. According to the naturalists, the Native Americans would use wooden buckets to collect the sap. Once the sap was collected, they would place the sap inside a hollowed out piece of log. They would then place hot stones that had been sitting in a nearby fire into the sap to evaporate the water. Once the stones cooled off, new hot stones were placed in. The sap was cooked all the way down until it became a block of sugar. The sugar could be easily carried and traded. National Maple Syrup Day (12/17). More about Maple Syrup. Hidden Bacon Pancakes. These go great with maple syrup! That looks like such a fun family day out! Maple syrup, straight from the tree, is a part of history and a neat learning experience-hope it was great!